People Led Development (PLD) sets in a classic example of community going for a plantation in their village area under FARM North East. Jana Unnayanan Samiti Tripura (JUST), Agartala has successfully motivated people not only for a plantation but also to be self dependent. Build up of confidence level among the community has resulted in a beautiful story. The members of the farmers’ club of Twisakolok village, near Agartala in Tripura were mulling on different ideas & prospects for raising their income. The month of April 2015 saw them all sitting together in discussing options for raising income. “We had many ideas coming up while thinking of ways & means to raise our income. Some thought of a grocery shop, while some thought of poultry farms or vegetable cultivation in groups but all that required a fair amount of investment”, said Ms. Rajmala Debbarma. Shambucharan Debbarma, the president of the farmers’ club however, had a different idea. He proposed plantation of Teak (Tectona grandis L.) a high value timber species or rubber (Ficus elastica Roxb.) in patches of land that were lying unused in the village. “We can earn by utilizing the waste land” said Shambucharan. The members once made known about the idea seemed to be in agreement. However, it was decided that they would go for Teak rather than rubber as cost for the seedling of the former are cheaper. “We decided that we would contribute for the Teak seedlings as we did not intend to depend on anyone” said a seemingly confident Ms. Kiran Debbarma. The member purchased the seedlings from nearby Khowai by at Rs. 7/- per piece. It was then just a matter of time when they cleared a plot of a little more than 1.5 acres (4 Kani) & carried out the plantation of 400 Teak seedlings April 2015. The farmers’ club has carried out the plantation in a group & would share the benefits at the right time. It was not just all. The farmers' club has more plans in store. Hiren Debbarma happily shared that they are planning to purchase a land of one Mantu Debbarma of Dumrakari village. “We intend to utilize this piece of waste land as well for more such plantations” said a smiling Hiren. Team JUST as usual was continuously supporting the farmers' club in all possible ways towards its noble mission. 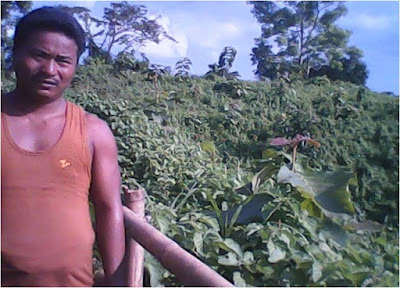 “It was encouraging for us to see that the Twisakolok farmers’ club has taken up such a noble initiative” said Mantu Debbarma, team member, FARM NE (JUST). Team JUST more importantly requested the farmers’ club to build 100% ownership of such initiative as it is not just about planting but also about maintaining & taking care. Twisakolok village today wears a new look with its community making a beginning not only against climate change also income generation.